South By Southwest’s opening evening began with Jon Favreau introducing his new film “Chef” with a story about how he decided that he needed to tell this small, and very personal tale — in comparison to the major visual-effects driven tent pole films he has been doing for the past decade or so. It definitely delivers both of those, and harkens back to his roots as the writer/actor of Swingers, but this time around he has brought along with him all of his movie star friends to help put on the show – including John Leguizamo, Scarlett Johannson, and an amusing cameo by Robert Downley, Jr.. If you look through the primary story, you can suppose just how personal the story is. Chef Carl Casper (Favreau) is the main draw at a high-end Los Angeles restaurant, whose work is his passion. So much so that his marriage has dissolved, and his son (Emjay Anthony) takes back seat — quite literally. 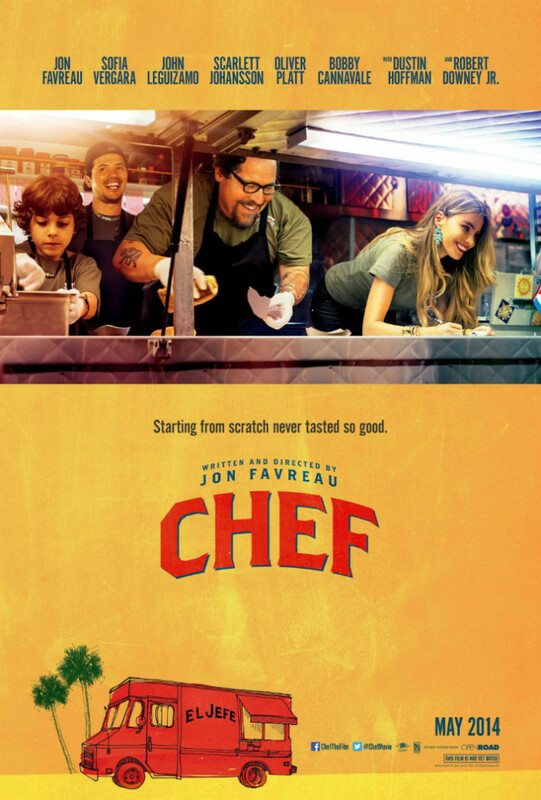 When word comes in that the most influential food critic in LA (Oliver Platt) is going to be paying a visit, he plans to pull out all the stops on his abilities, but his boss Revo (Dustin Hoffman) decrees that he cannot experiment and forces him to deliver the tried and true menu that everyone has come to love. The result is a scathing review, a misplaced tweet, and an in restaurant outsburst that goes viral. This sends Casper on a journey where he has to re-find his passion, reengage with his son, and rebuild himself by using his culinary expertise to start a Cuban cuisine food truck. The script has a charm that Swingers had, but with more maturity — indeed, written by a more mature man. The humor feels natural and organically woven into the characters and the story. This stems from Favreau’s ability to improvise off script with his actors — even 10-year old Emjay). However, the film, as a whole, feels like a couple different movies. Act 1 is the introduction to Casper’s world, which is ultimately turned upside down with the lost of his job. Act 2 moves into a flight to Miami, and ultimately Act 3 becomes a buddy road movie. Unless I’m reading it wrong, which means there is no Act 3 — which feels weird. This all means that it felt a bit draggy and mis-paced — like I didn’t have a gauge for when it was going to end. But this is nitpicky. The strength of the performers alone are enough to keep the story delightful and entertaining. As far as reading Favreau’s “personal” story in a film about a chef, I can’ help but feel that a film critic railed on somthing like “Cowboys and Aliens” — a film where the studio told Favreau to just deliver the kind of menu everyone has come to love. He was hurt by the review, and refused to direct that same menu. And now, “Chef” is his food truck. He has gone back to making the kind of film that originally stoked his passion of filmmaking. Note: A one-sheet has yet to be posted. I will update as soon as it is.